Recover two items that the Mad God claims to have misplaced. My first trial in Sheogorath's realm awaits. Valaste and Shalidor have uncovered what they need to get me where I need to go. Speak with Valaste in the Mages Guild in Elden Root (Grahtwood), Wayrest (Stormhaven), or Mournhold (Deshaan). Enter the Shivering Isles and speak with Haskill. Recover the fork from Vuldngrav. Recover the staff from Asakala. Collect the book and return to the Guild. Talk to Arch-Mage Shalidor outside the Mages Guild. He says Valaste finished translating the tome. Talk to Valaste. She asks you if you are ready for Sheogorath's first trial and sends you to talk to Shalidor. Tell him you're ready, then enter the portal to the Shivering Isles. Talk to Haskill. Sheogorath wants you to recover two items, a fork and a staff, before you can learn where the tome is. Sheogorath lost the fork in Skyrim during the Merethic Era. He was visiting his friend Korthor in Vuldngrav. Enter the portal to Vuldngrav, then enter the Vuldngrav Catacombs. Examine the chest to the east. Defeat the three waves of Draugr, then use the previously frozen gate to enter the next area. Continue to the snowy room where Korthor floats in the center. Defeat him and take the fork. Talk to Haskill who appears behind Korthor along with another portal. The staff is in Hammerfell with Prince Maleel, the Scythe of Yokuda. Enter the portal to Asakala. Talk to Arch-Mage Shalidor. The prince's underlings placed magical seals to guard the prince's resting place. 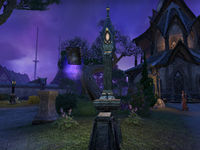 You need to use the essences, floating balls of light, to unlock the keystones at the base of each of the four statues. He gives you a power that allows you to collect the essences. You should unlock the first two statues while he thinks about the other two. Collect four essences by running over to them. Once you have four, activate a scarab seal at the base of one of the statues. Repeat for the other statue. 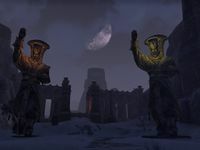 Talk to Shalidor again after both statues are activated. He thinks defeating the prince's generals should activate the other two. Enter the western passage and defeat Sahdina the Scorpion. His essence will follow you back to the scorpion seal, which is also on the west side. Enter the eastern passage and defeat Rashomta the Spider to get his essence. Then, activate the spider seal. Use the key ritual orb in the center brazier to open the tomb. Head up the steps into Prince Maleel's Tomb. Defeat Maleel and take the Wabbajack. Go back outside and talk to Haskill on the steps. Enter the portal to the Shivering Isles and talk to Sheogorath. "Look, Haskill! Forky's back! It's so nice to see him again! Oh. And good to see you too, mortal. I guess." A hostile Pig that vanishes after a vew seconds. It doesn't work on Sheogorath, Haskill or Shalidor. Talk to Sheogorath after you finish. He takes the staff and gives you the book. Take Circus of Cheerful Slaughter from the podium to the left of Sheogorath and Haskill. The book transports you back to the Mages Guild. Talk to Valaste and give her the book. She gives you the Artifact-Hunter's Band and 336 Gold. This page was last modified on 14 August 2017, at 20:17.